Hello to everyone out there in the blogosphere to another edition of Mastication Monologues! Today I am going to be talking about a restaurant that I had been to before, but I never really tried their take on a classic type of burger. The restaurant I’m referring to is Champps Americana Restaurant located at 2301 Fountain Square Drive Lombard, IL. The establishment is a typical American sports bar, but I did see an item on their menu that played to one of my culinary weaknesses: spicy food. Now I have proclaimed my spice tolerance in previous blog posts, so I won’t go into much detail about my Man versus Food-esque type adventures. However, I did see the Firehouse Burger which was calling to me like a spicy south of the border senora. Vale, vengo ahorita, mi amor! I got it well-done (I know many meat-lovers will call me a savage for “burning” my meat), and it looked delicious when it was presented to me. According to the menu, I was face to face with probably a half-pound mound of beef festooned with red and yellow bell peppers, green chiles, poblano peppers, onions, Chipotle Tabasco, Cajun seasoning, pepperjack cheese, and fresh jalapeno peppers. These various ingredients separated this burger in my mind from other typical spicy burgers I’ve tried in the past. Plus, it was accompanied with a mini-molehill of waffle fries. When I started on the burger, I had to slice it in half because I put everything on it, and I can’t unhinge my jaw like a python swallowing a baby hippo. Upon first bite, I realized that I was in for a messy time because they seemed to have doused the bun with Tabasco which in turn led the bun to become quite soggy. Naturally, my originally firm grasp of the burger deteriorated into a melange of cheese and peppers. Thankfully the extra gooey and tasty pepper jack managed to hold it all together like some type of magical dairy rubber cement. So this detracted from the meal’s greatness, and the mild bell and poblano peppers really didn’t do much for the burger. Sure, they added vibrant colors to the general beige background of a hamburger, but they were mushed into the background. 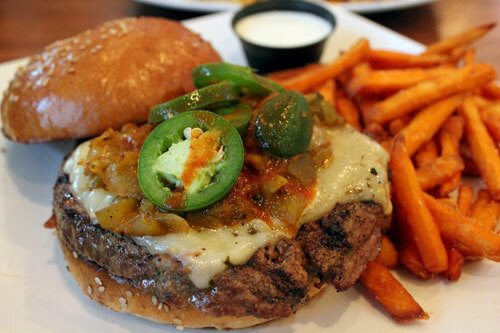 However, the jalapenos were game-changers because not only did their vibrant verdant hue brighten up the plate, but their crisp texture and loud flavor allowed the true spice of the burger shine above the general muck of mild peppers. Once I finally demolished my main entree, I began chipping away at the waffle fries which were not quite golden brown but were still crunchy on the outside and fluffy white on the inside with minimal salt=perfect fries. Afterward, I found out that they had a drink special (I don’t know if it’s everyday or not) where I could get a pint of certain beers for only $2.50! That is quite good for the Chicago suburbs for those of you who are unaware. 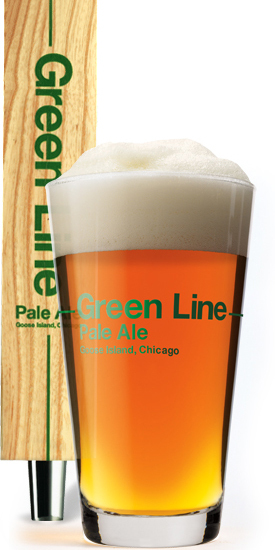 I decided to pick a pint of Goose Island’s Green Line. It’s a pale ale that has a golden hue, and I could smell a slight citrusy aroma wafting toward me during every sip. There was a clear bitter, hoppy bite to the brew, but it was not overwhelming like other IPAs. If you’re looking for stronger tasting beers, this would be the equivalent of sticking your toe in the swimming pool to see if you’re ready to do a cannonball into the wonderful world of beer tasting. So if you’re looking for some interesting burgers or great drink deals, head on down to Champps! It’s not quite the m.v.p. of sports bars, but I think if they work on the fundamentals they could be in the pantheon of greats. 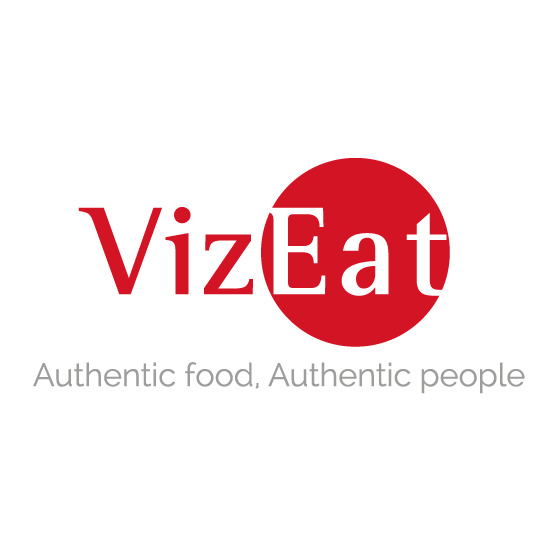 Posted in American Cuisine, Barbecue, Burgers, Chain Restaurants, Chicken Wings, Comfort Food, Tex Mex and tagged Bar, Beer, Beverages, bread, Burger, cheese, Chicagoland, dining, Food, fried, grill, hamburger, hot, jalapeno, peppers, potatoes, restaurant, Reviews, Sandwich, sauce, spicy, tabasco. Bookmark the permalink. Very good review. I love burgers, I”ll check it out.